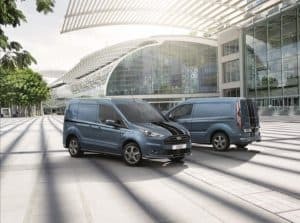 Ford has revealed its new Transit Connect van at the Hannover CV Show and it’s on sale right now. The New Ford Transit – if we can be so crude – offers even more attractive running costs for commercial vehicle users by coming with even more fuel efficient engines. Buyers can choose between the new 1.5-litre EcoBlue diesel engine or single‑litre EcoBoost petrol engine. Both come linked to a six speed manual gearbox as standard, but an optional eight-speed automatic transmission has the ability to optimise fuel efficiency and CO2 emissions by up to 12 per cent. Most fleets will be drawn towards the 1.5-litre diesel, which is offered with three different power outputs: 75PS delivering fuel efficiency from 60.1mpg and 124g/km CO2 emissions, 100PS – 60.1mpg and 123g/km CO2; and finally, 120PS – 56.4mpg and 130g/km CO2. Meanwhile, the one-litre EcoBoost petrol introduces cylinder deactivation technology to the Transit range for the first time – a clever feature that rests some of the unit’s cylinders when the van is stuck in stop-start traffic in a bid to save fuel. This helps the petrol Transit Connect achieve fuel efficiency from 44.1mpg and CO2 emissions from 146g/km. Ford says that the new Transit Connect will offer commercial vehicle operators an outstanding breadth of capabilities, with short and long wheelbase options providing load volumes up to 3.6 m3 (VDA), payload capacity ranging from 410kg to 900kg, and body styles including van, kombi and double-cab-in-van. A new variant – the Transit Connect Sportvan – delivers a hefty dash of style to what can be a pretty drab vehicle, with an exterior styling kit, signature matt black sports stripes with silver or orange accents and 16-inch dark stainless alloy wheels. This ups the number of Ford’s Sportvans to four, joining the Fiesta Van, Transit Courier and Transit Custom Sport models. Hans Schep, general manager of commercial vehicles at Ford of Europe, acknowledged fleets’ constant need to reduce fuel spend. “Fuel costs are critical for van operators and we have invested in advanced new technologies to bring savings to our customers,” he commented.